In Japan, the winter can be very cold. It also has snow falls occasionally. Thus the Japanese came up with some unique ways to stay warm during winter. 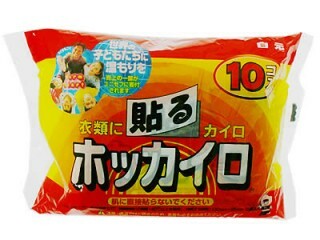 There are varieties of pocket warmers, called ”KAIRO” in Japanese sold in Japan, and you can get one at any convenience stores, supermarkets and drug stores. Some called it ”HOKKAIRO”. credit: jetalone - some rights reserved. I haven't seen any of these outside Japan and probably not even in my country. These are amazing little plastic packets which, when shaken, heat up to an average 40°C (104°F) and last up to 20 hours. These are also good to put under the blankets in winter, to help warm up children and the elderly, for inside your ski jacket or motorcycle jacket- anywhere you need to feel a bit of warmth! Some people stick it on their stomach area or the back of their body. Also, you can use them to warm up food when out and about- the possibilities are really unlimited! The major ones are disposal kairo but reusable eco kairo is getting popular since it appeared in the market. Each pad is filled with iron powder. 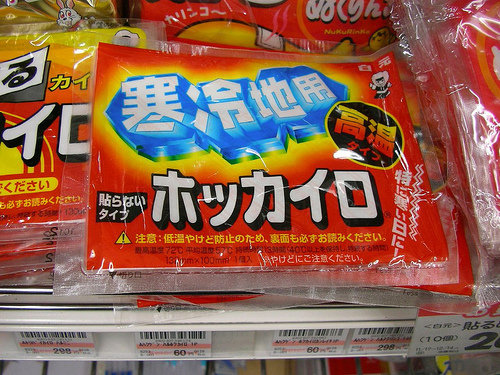 It reacts with oxygen to give off heat when removed from the packaging. There is also a Kotatsu, a low, wooden table frame covered by a futon, or heavy blanket, upon which a table top sits. Underneath is a heat source, often built into the table itself. Kotatsu are used almost exclusively in Japan, although similar devices are used elsewhere. credit: dejahthoris - some rights reserved. Electric: The modern style of kotatsu (oki-gotatsu (置き炬燵)) consists of a table with an electric heater attached to the underside of the table. This evolved from a clay pot with hot coals placed under a table. The kotatsu is usually set on a thin futon, like a throw rug. 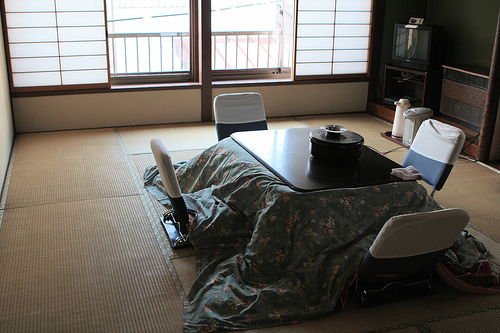 A second, thicker futon is placed over the kotatsu table, above which the tabletop is placed. The electric heater attached to the underside of the table heats the space under the comforter. Charcoal: The more traditional type is a table placed over a recessed floor (hori-gotatsu (掘り炬燵)). The pit is cut into the floor and is about 40 centimeters deep. 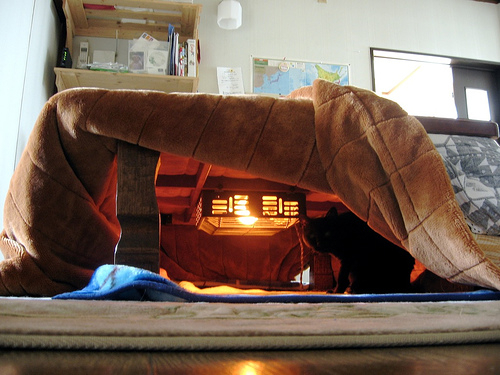 A charcoal heater is placed somewhere in the pit's floor, walls, or, as in the modern-style kotatsu, attached to the table-frame. There are pit type kotatsu with an electric heater too. Know how I could build one? And then find a pattern for the futon and quilt in English?